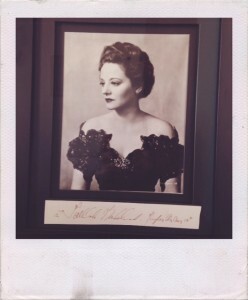 Mhairi's Vlog Darling of the Gods, Feathers and Toast, Mhairi Morrison, Tallulah, Tallulah Bankead, Tennessee Williams. permalink. Life is full of weird, unexplained coincidences, some which are startling. For instance, when I was at uni I lived in an apartment complex called Bannockburn. When I did my junior year abroad, I lived a few miles from the real Bannockburn in Scotland. When I had my first job in Beverly Hills, every day I crossed a road called Bannockburn Drive. Then on a visit to Scotland, I met my husband at Bannockburn. Weird. So I don’t know why the weird connections with Tallulah, but maybe there is an explanation in quark theory or chaos theory (just reading about them, don’t understand or know what they are). Yes, I think I would declare that it is all down to one of those two theories. It sounds smart. That is really really strange. Its like you came across signposts throughout your life saying that word and then met the love of your life there. amazing. Will investigate the quark and chaos theories…don’t know anything at all about them. Thanks so much for watching and sharing your insights! It’s so much fun understanding how you created the character of Tallulah Grace! Even the name and what those names mean to you! Your timing and delivery are so perfect and spot on as Tallulah! Possibly because I have watched every video on your YouTube site at least once… the character of Tallulah is so developed and she seems so much more developed and real than some characters in TV or films. She is very complex and it really is interesting to see her in the cooking show when she is in her character and then to see her switch to the BTS and have the nuances to her character seem so distinct and fitting! The Tallulah Bankhead mystery is fascinating! Utterly incredible and totally uncanny! I am still trying to sort through it all and it just seems like you have her spirit channeling you in some way! Maybe she found you and has unresolved things she wanted to accomplish and she is going to do it through you! All of the other similarities are just amazing and yes… validating in many ways! How much fun it would be for someone who knew her to meet you and see other possible connections! Agree that it does mean you are on the right track with Tallulah Grace! So happy Holly gave you the book! It all goes to developing your character even further and then the similarities to you Mhairi are even more unbelievable! Love mysteries and this is an intriguing one! Imagine what might happen if you were to stay in her home for any amount of time… the dreams you might have while sleeping could be very interesting! Thanks again Mhairi! Thank you for such an interesting and detailed comment darling. So much appreciate you taking the time to watch and write! Yes I considered that, that she (Tallulah Bankhead) may have something she still wants to accomplish and is back to do it through me and the character. She and I also share a serious passion for womens rights, and so am thinking that there is some crossover there too. We have so much in common, it really is bizarre. The autobiography I have of her has almost all the pages overturned as one coincidence after another occurred. Really amazing. Thank you so much for watching all the episodes of the show and for your very kind comments about the character. I really spent months working and developing it as I want it to be as complex a character as possible. Ultimately to sustain 7 seasons of a TV half hour show!